"Telltale returns their most successful franchise... now with a fan favorite." After dabbling with the Borderlands, Game of Thrones and Minecraft franchises, Telltale Games return to their most successful franchise they worked on, The Walking Dead, but this time with a familiar character. The Walking Dead: Michonne stars the sword-wielding badass during untold times between issues 126 and 139 in the comics. While it also takes place in the same universe as the first two seasons and 400 Days, Michonne may run into characters or refernces from those games. The first episode, In Too Deep, starts this three episode mini-series in a solid way, but it does feel like deja vu for those that have been having Telltale fatigue or played the previous Walking Dead games. Michonne left Rick's group and is still struggling with her nightmares involving the loss of her family. At the start of this first episode, she is with a new group on a ship led by Pete. When their ship gets stuck, Michonne and Pete find a nearby ferry to search for supplies and repairs while the rest of the group starts doubting Pete's decision making of finding more survivors. Turns out this supply run goes wrong when they're captured by another group from a colony named Monroe. Stop me if you heard this before if you played the previous Telltale offerings in this franchise or watched the TV show. 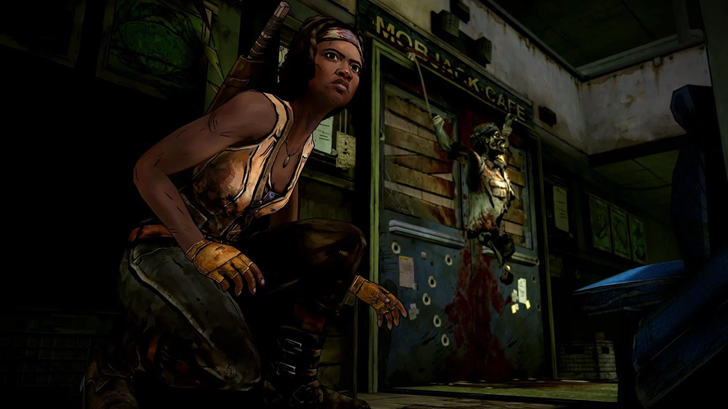 The Walking Dead: Michonne relies on a familiar formula the series is known for, but the decision making and QTE-based gameplay remain top notch to no surprise. Playing as Clementine and the 400 Days characters in previous games is a lot different to playing as Michonne in terms of tone. Being a skilled badass cutting through Walkers with ease as long you're executing the QTEs perfectly is a nice change of pace compared to the past characters you played as. Combat feels more fast and gruesome because of her skill set alone. From the get go, this is definitely Michonne's story and the supporting cast is currently an afterthought. Sure it's the first episode of three, but I wished they touched more on the other characters' backstories and the antagonists' motives. Also, being Michonne means I should really role play these decisions differently than I would handle Clementine's. Instead, those choices are the more of the same that past Walking Dead games had and I definitely regret some of them, but we'll see the next two episodes go. With all the work on numerous franchises, TellTale hasn't had a good track record on their games' technical performance. Their games suffered from framerate dips, random crashes and other bugs. 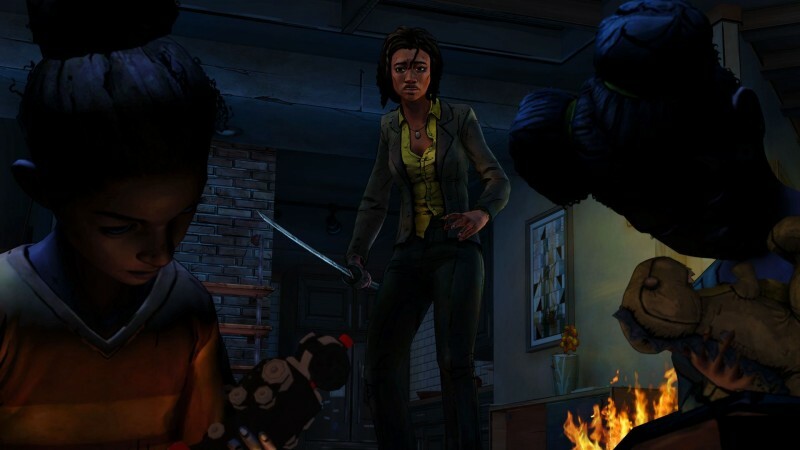 From my time on the PS4 version, the first episode for The Walking Dead: Michonne alone is the first TellTale game in a long time that improved the visuals and performance drastically. Their graphical engine looks crisper, textures were more detailed and more importantly no framerate issues. The soundtrack and voice cast also sound competent, which is no surprise to Telltale standards. I hope the story heads off to different directions for The Walking Dead: Michonne's next two episodes. The two hour In Too Deep is a solid yet safe start treading too much familiar water that franchise fans are used to. It feels great to play as a more confident person like Michonne against the Walkers and this series' villains, but even badasses have their soft spots. Her past still being her weakness is starting to be played out as much as retelling a superhero's origin story in the movies industry. I'm waiting to see if there's gonna be moments and decisions as beautifully impactful as the high points in Telltale's previous two seasons for Michonne, but if you're a fan of the character and the franchise, this is still worth playing for $4.99 ($14.99 for all three episodes). Feels great to play as someone as confident as Michonne against Walkers compared to other characters in past games.